The towing eye is installed in the boot under the floor. The driver must stay at the wheel of the towed vehicle. Driving on motorways and fast roads is prohibited when towing. When towing a vehicle with all four wheels on the ground, always use an approved towing bar; rope and straps are prohibited. 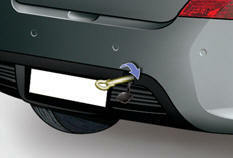 When towing a vehicle with the engine off, there is no longer any power assistance for braking or steering. 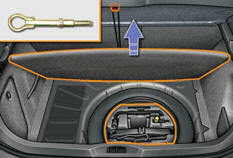 Place the gear lever in neutral (position N on the electronic gearbox system or automatic gearbox). Failure to observe this instruction could result in damage to certain components (braking, transmission...) and the absence of braking assistance the next time the engine is started. 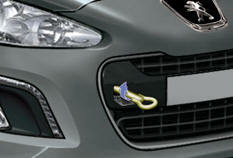 Unlock the steering by turning the ignition key one notch and release the parking brake. Move off gently and drive slowly for a short distance only.